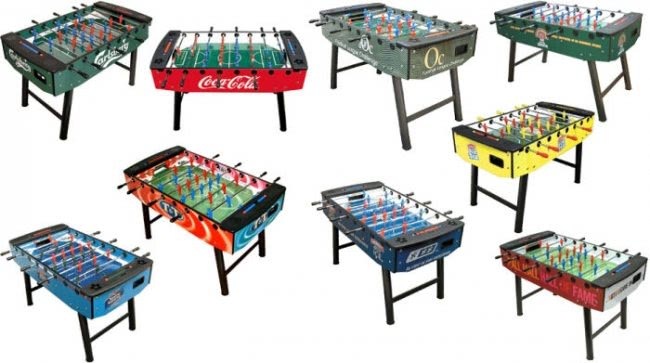 Professional 5ft Italian FAS foosball table. Suitable for home and communal use. Detachable legs & height adjusting feet. FAS tables are made to the highest standards in Italy. It is recognised as one of the top brands in Europe. The Club is a sturdy, durable and safe table that is suitable for all sites, including games rooms, schools, youth clubs, institutions, offices or common rooms. The legs are easily detachable and bolt securely to the underneath of the table. In addition, the table feet can be height adjusted. This premium table includes a 'sandblasted' playing surface, enabling you to maintain excellent control and grip on the foosball. Chrome plated heavy duty solid steel rods. Sandblasted playing surface for more grip. V-footed players provide superior grip and ball control. Full size tables such as the Club are perfect for branding with logos or colours. Our courier will deliver your product to a ground level room of your choice; however, we do ask that you check your goods will fit in your property and that any entranceways, hallways, corridors etc are free from obstruction. Delivery is by a single person courier and we ask that an able bodied person is available to assist with unloading and moving table indoors.